The low floor AEC Renown was announced in July 1962 and became the first new model to appear following the merger of AEC and Leyland. It was a direct replacement for the Bridgemaster and at first glance a Park Royal bodied Renown looked very similar, but below the skin the new Renown had a traditional chassis which it was hoped would appeal to more operators. 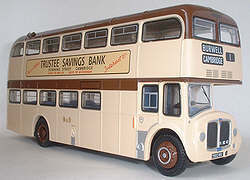 The Bridgemaster used a sub frame system similar to Routemaster however this had restricted body options with only Park Royal supplying suitable bodies, many operators were put off by this and the fact that the original rear entrance design didn't adapt well for use with forward entrance bodies. Two Renown demonstrators were built in 1962 and one spent some time with London Transport before being sold. The majority of vehicles had forward entrance Park Royal bodies which shared many parts with the earlier Bridgemaster, however Leicester Corporation took advantage of the separate chassis and chose East Lancs rear entrance bodies for it's examples. The main problem the model faced was the growing demand for one man operation, and the availability of more suitable first generation rear engined double deckers, in the end the AEC Renown proved only slightly more successful than it Bridgemaster predecessor with a total of 251 examples being built between 1962 and 1967. The main customers for the vehicle were the BET group operators including North Western, and a number of municipal operators including Nottingham and Wolverhampton. A few examples were also brought by independents, one of the most notable being King Alfred of Winchester. Short chassis versions were also purchased by Western Welsh and Oxford. 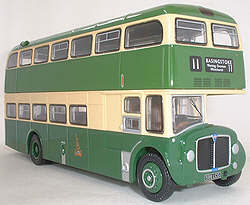 The AEC Renown models were first announced by EFE at the January 2004 London Toy Fair, the first production examples followed in September 2005 with the first release being at the Duxford Showbus Rally, the first standard release North Western 30702 followed a couple of weeks later. The models represents the long chassis vehicles and can be produced in four variations, the difference being the type of drivers cab door, either sliding or hinged. A third Roe bodied version that lacks the lower deck emergency exit door on the rear was added to the range in the Spring of 2007 while fourth version with the same rear end treatment but with the alternative sliding cab door was added in 2009, the first release of this fourth version was labelled as an AEC Regent V by EFE.